Plasma cells are terminally differentiated B lymphocytes that secrete enormous quantities of antibodies. During the initial stages of an antibody response, plasma cells are found in the extrafollicular regions of secondary lymphoid organs. These extrafollicular plasma cells are responsible for the initial surge in antibody levels after immunization or infection, but are thought to survive for only several days before undergoing apoptosis. A second wave of affinity-matured plasma cells emerges later in the response and seeds the bone marrow, where they can persist for many years. These long-lived plasma cells are solely responsible for maintaining antigen-specific antibodies long after clearance of infection or vaccination. 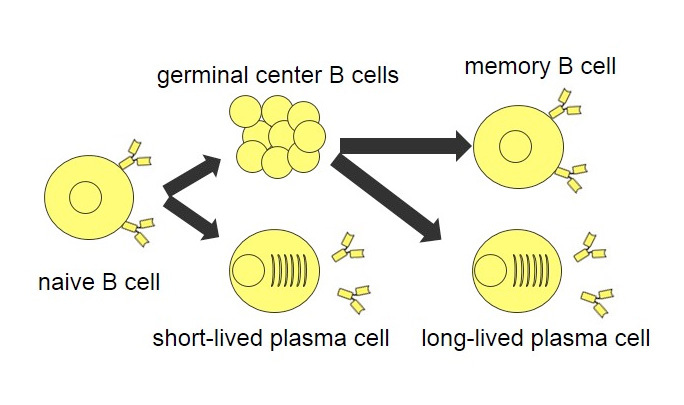 Recent work from our lab has demonstrated that the initial activation conditions of B cells imprints the lifespan of plasma cells formed subsequently. For example, the transcription factor ZBTB20 is specifically required for long-term antibody production when alum, a common vaccine adjuvant, is used. Ongoing work is focused on identifying additional genetic regulators of these survival programs and the infections which induce them.